When I was a kid, the Fourth of July was practically my favorite holiday (next to Christmas). Let's face it, it's a time when playing with fire is pretty much expected if not condoned. Not that we had access to "real" fireworks. The good stuff was always banned. Oh, they started selling "Safe and Sane" fireworks when I was in grade school and I'd line up with the rest of the suckers at the booths that began cropping up a couple of weeks before the Fourth. We'd buy our snakes, sparklers, Morning Glories, Picollo Petes and smoke bombs. If we could scrap together enough allowance, we'd spring for the kits with names like Colossusor Vesuvius. They'd contain larger fireworks fountains with names that sounded like Kung Fu movie (i.e. Blooming Ground Flower, Whistling Tiger, Crouching Bottom Dweller or Sparking Hog Wallow). I'd line up my firework purchases for days, figuring out the perfect order to light them off on the Fourth. Then, when the actual day was upon me, I'd anxiously count the hours until it was dark enough. To take the edge off, I'd periodically light snakes or smoke bombs. Finally, dusk would inch its way in and I'd prepare for the show. Lots of times we'd invite the neighbors to come over and pool their fireworks with ours. The adults would sit in lawn chairs and talk about the fireworks they had as kids: Roman Candles, Silver Salutes, Skyrockets, firecrackers and Cherry bombs. No matter how many Safe and Sane fireworks I had or how big the kit was, it never took more than three minutes for them to go up in smoke. And the bigger the cone or tube fountain was, the more disappointing it was. My mom would "ooh" and "ahh" for our benefit, but everyone pretty much accepted that we could have gotten just as much of a fireworks show out of burning the money we paid for the crap. After we'd finished torching our stash, we'd either jump in our stationwagon to drive to a location where we could watch professional fireworks being set off at Bronco Stadium. I don't think we ever actually went into the stadium to watch them because you had to pay. It was just as good to sit on the room or hood of the car in the parking lot and watch the skyrockets exploding in the sky above the stadium and cover our ears at the explosions. Sometimes we wouldn't even have to drive to see the fireworks. We'd climb on top of my grandmother's garage and lie on our backs and watch the firebursts above the tree line on the horizon. As I got older, we figured out how to genetically alter safe and sane fireworks to make them a little more satisfying. We discovered that you could use pliers to pinch a Picolo Pete at the base so it exploded at the end of its piercing whistle. And we learned that we could use the gunpowder my brother used to reload shotgun shells to pack empty smoke bombs to create homemade cherry bombs. Eventually, we found out that we could procure Unsafe and Insane fireworks from makeshift booths on Indian reservations outside of Boise. 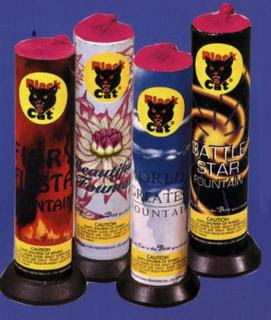 I was almost in tears the first time I was able to purchase a belt of a thousand Black Cat firecrackers. And then there were the Roman Candles that you were supposed to stick in the ground and light. It was much more fun to hold them and feel the percussion as the fireballs spit out the ends like fiery magic wands. But, as with Christmas, the magic eventually fades as you enter adulthood, and the joy of setting off fireworks is folded up and placed with mothballs in the back of your memory. Fourth of July becomes just another time off with too much traffic and unwelcome hype. And you sneer at the suckers lined up at booths waiting to burn up perfectly good money. A couple of years ago, though, Tess and I drove to Boise to visit my brother and sister-in-law and my niece and nephew. Brendan was about the age I was when I horded my fireworks and counted them daily like a miser with gold. And sure enough, he'd bought a super colossal fireworks kits with all of the safe and sane fireworks I'd had as a kid. And sure enough I edged him out in the race to light fuses after darkness fell that Fourth of July in Boise. He protested briefly, but then stood in awe with me as we watched the Blooming Ground Flower ignite and spew sparks. Then we raced each other to see who could light the next firebreathing cone. I guess you are never too old to play with fire. There is a huge geek factor in learning how fireworks are made. It is truly a merging of art, science and rapture. For me, the Fourth has become a day of quiet reflection on what was and what is no longer. This year the city banned picolo petes because last year some guy got killed by a homemade bomb. There's a $500 fine for setting them off. Since the county is still allowing them my bet is people will pretty much ignore the ban and take their chances. You know we share the same Geek gene. Hope your Fourth is peaceful. Darwin's theory has always pretty much gone hand in hand with fire and fireworks. I suppose we can blame Prometheous. But what doesn't kill us can pretty much mame us, too.